Sweet sassafras! Halloween is almost here. If you are looking for a costume straight from Nice and Friendly Corners, look no further. 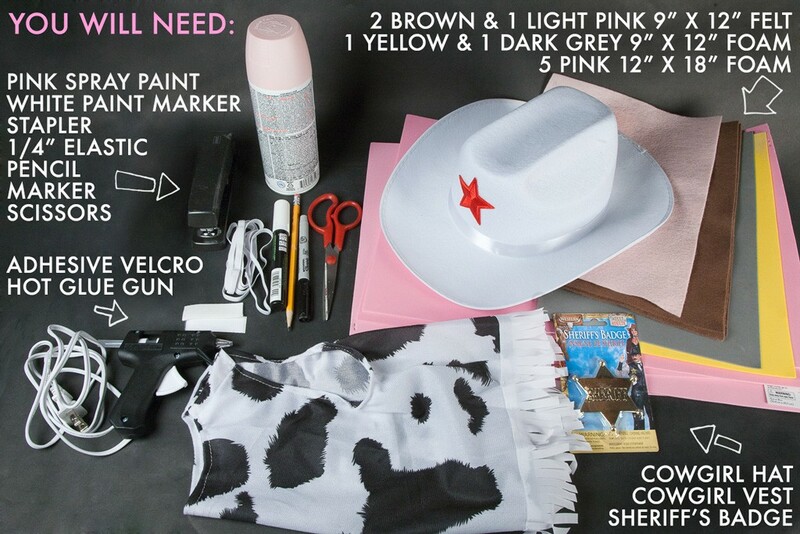 This tutorial will walk you through the steps for a DIY Sheriff Callie outfit- pink hat to pink cowgirl boots. So beware outlaws! There’s a calico cat in town and she’s keeping the Cowpoke Code. YEE-HAW! With a few costume components, a couple wardrobe basics and some supplies from the craft store, you’ll be be able to pull this look together. Step 1. MAKING THE HAT- Spray Paint the hat pink. Let dry. Step 2. Cut out the template pieces for the hat. You will need 2 copies of the template on page 1. Trace on the pink foam. Step 3. Hot Glue the foam pieces to the top brim of the hat as show. Step 4. Re-use the template to cut another set of pieces for the hat. Hot glue the pieces on the bottom rim of the hat. Try and line up the outside edges of the foam as best you can. Step 5. Trace the larger ear template on the gray foam to make 2 ears. Step 6. Use the smaller template to cut 2 pieces out of pink felt and glue to the felt to the gray ears. Step 7. Hot Glue the ears to the hat, as shown. Add the glue to the bottom edge of the ears, so that the top of the ears stick up from the hat a little. Step 8. MAKING THE BOOTS- Trace the templates for the boot on a piece of pink foam. Step 9. Cut out 2 sets of pieces for the boots. Step 10. To assemble the boots, place the front and middle pieces together, so that the center tab is overlapping the front piece, as shown in the picture. Hot glue the tab. Step 11. Have the shoe that will be worn with the costume to use as a guide. Place the front of the boot up and curve the sides down around the shoe, as shown, to start forming the boot. Hot glue the tabs to hold the sides in place. Step 12. Place the top part over the boot. Adjust the placement and trim the sides as needed to fit the shoe. Hot glue the pieces together. Step 13. Staple elastic pieces to the boot, near the bottom and top. If you can, have your child put on the shoes and measure the elastic to fit them. Step 14. Add stitching embellishments with the paint marker. Step 15. Repeat steps 10-14 to create the 2nd boot. Step 16. MAKING THE VEST- Trim the fringe off the cowgirl vest. Step 17. Use the paint marker (or other marker) to trace one side of the vest onto a piece of the brown felt. Step 18. Cut out the felt shape and hot glue on to the vest. Trim up the edges as needed to make the piece look even. Step 19. Repeat steps 17-18 with the other side of the vest. Use the paint marker to add stitching embellishments to the vest. Step 20. BANDANA AND BUCKLE- Print, cut and trace the bandana template onto a piece of pink foam. Step 21. After cutting out the foam bandana, attach the adhesive velcro to the ends. Step 22. Cut out an oval from the yellow foam to create the belt buckle. Loop a piece of elastic to the buckle and hot glue to secure. The buckle can now be slipped over any belt to complete the look of the costume. 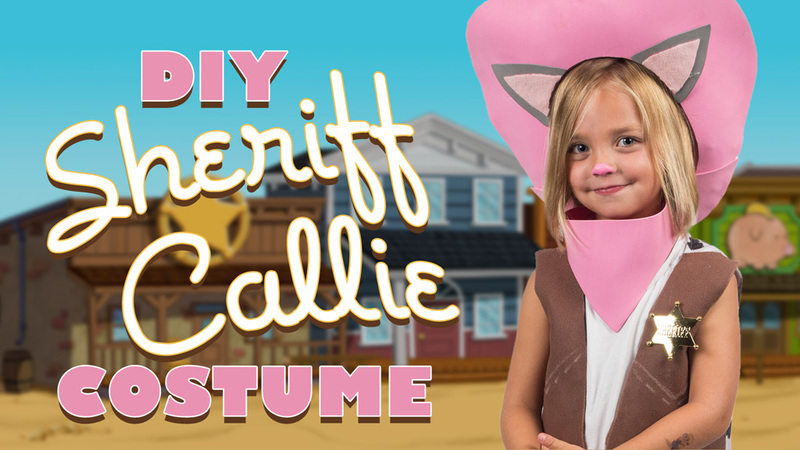 The final touch on the costume will be adding the sheriff badge and painting the face to look like Sheriff Callie! If you give it a shot, show us how purrfect it looks on Facebook, Instagram, and Twitter. Here’s a cheat cheet for you Pinterest page.